I just got this press release via email and I thought that you Hendrix fans might be interested. This is a GREAT documentry. I saw it when it was originally released. 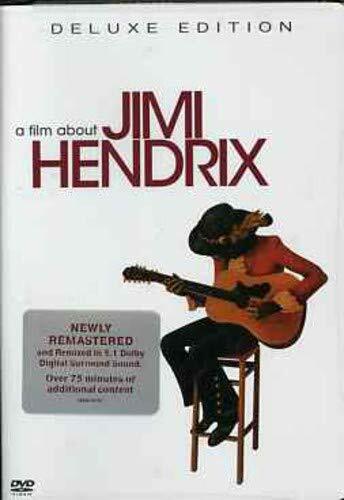 And the bonus features make this a DVD worth having if you are a Hendrix fan! Surround sound and is loaded with more than 75 minutes of previously unreleased bonus features. From The Ukulele To The Strat: A 63-minute film featuring previously unreleased interviews with Mitch Mitchell, Billy Cox, Buddy Miles, Eddie Kramer, Eric Barrett, Gerry Stickles, Al Brown, John Hammond, Linda Keith, Al Hendrix, Freddie Mae Gautier and Fayne Pridgon, all of which were filmed in 1972 during production of the original film, but not included in the original film. Stone Free: A newly cut version of Jimi Hendrix's performance of "Stone Free" from the July 4, 1970 concert at the Atlanta Pop Festival. This new 6-minute video features Jimi's original performance, restored and uncut for the very first time. Dolly Dagger: Jimi's originally studio engineer Eddie Kramer breaks down the mix of "Dolly Dagger." This 6-minute film was originally filmed at Jimi's Electric Lady Studios in 1972.